The all new NZM, is a microprocessor based Digital Wall-Mount Area Monitor, designed for clear visibility and ease of use. Featuring a wall-mount chassis, the Model NZM has a four digit LED display, which is readable from up to 30 feet away. The backlit indicators along with audible alarms warn of low radiation, high radiation, instrument failure, detector failure and low battery. NZM comes with battery backup which provides long hours of additional use after the primary power is removed. NZM comes with an option of an external detector in lieu of an internal detector. Digital Gamma Area Zone Monitor (ZM) is an instrument designed to measure and monitor gamma radiation exposure rates in the working areas of industrial radiological installation, radiation source rooms and other radio-isotope laboratories. Audio/Visual alarm is provided to alert the radiation worker when radiation level exceeds the normal or other limits which can be pre-set. 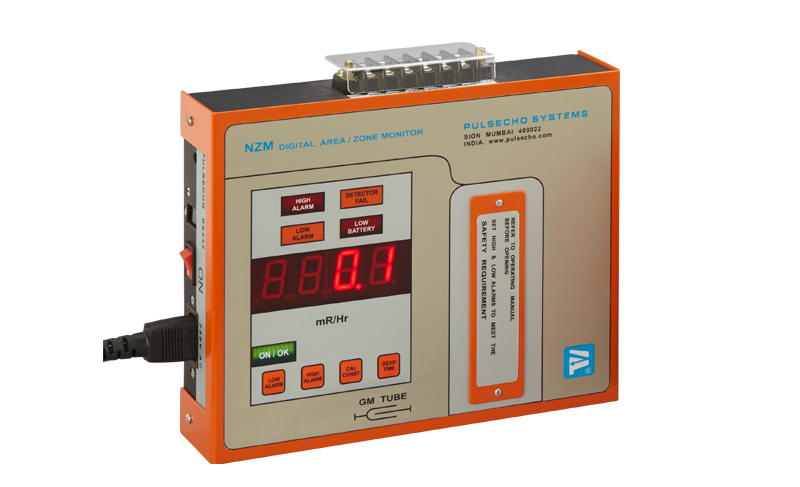 ZM incorporates a GM counter and works from mains with a battery back-up in case of mains failure. The self-diagnostic circuitry of the ZM gives a non-resettable alarm if there is a circuit/GM Tube failure.